The Fury® appears to be something from the farthest fringes of the two-wheeled world, yet it's a Honda, through and through. It's the rolling incarnation of the pure, undiluted chopper essence, a machine that simply looks right, sounds right, and goes straight to the heart of radical enthusiasts. Yet despite the extreme lines and head-turning looks, the Fury is backed up with the same fit and finish, functionality, affordability, quality, and reliability that are built into every Honda. BRAKES: A single, powerful 336 mm diameter front-disc brake is complemented by a 296 mm brake disc in back. An ABS version is also available. 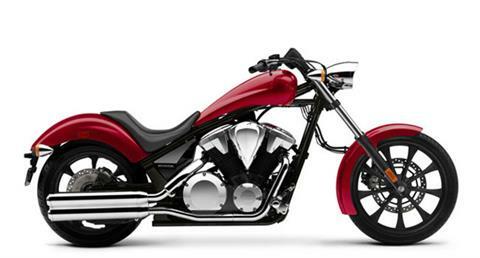 V-TWIN ENGINE: A powerful 1312 cc, 52-degree V-twin engine with a single-pin crankshaft and dual balancers has plenty of torque, and the feel only a V-twin can deliver. LOW SEAT: The Fury's super-low 26.9 inch seat height is an integral design element that fits in behind the slim and long fuel tank. UNIQUE WHEELS AND TIRES: A fat 200 series rear tire is paired with a slim 21 inch front tire, both wrapped around distinctive alloy wheels.